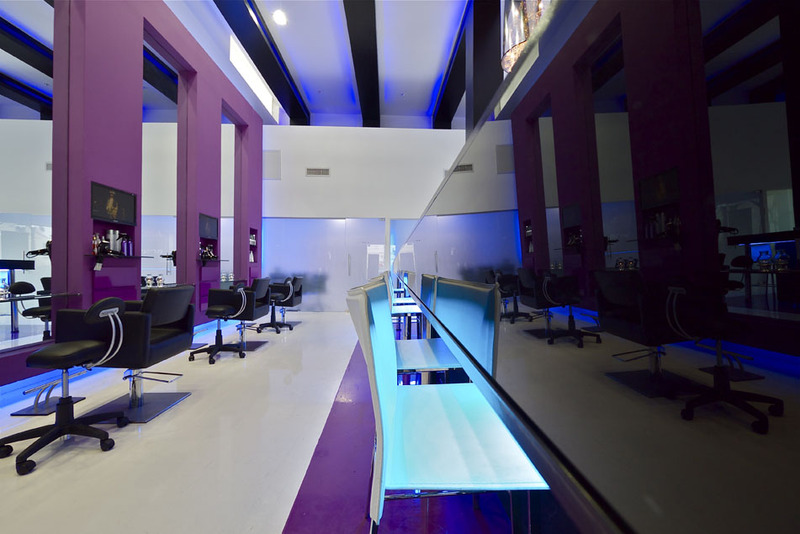 Designing an expansive hair salon on a limited budget. 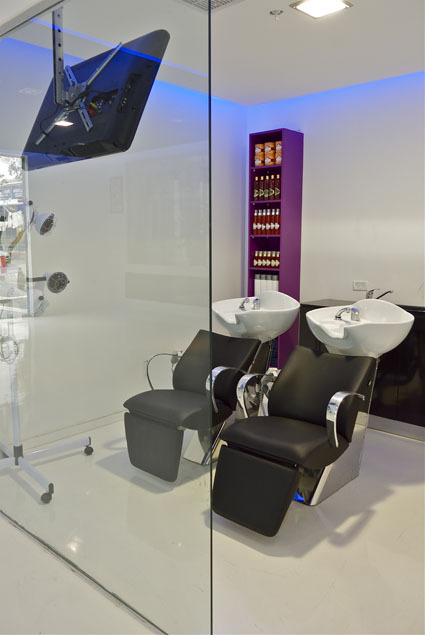 Giving the space a well suited, modern look that remains up to date for a long time. 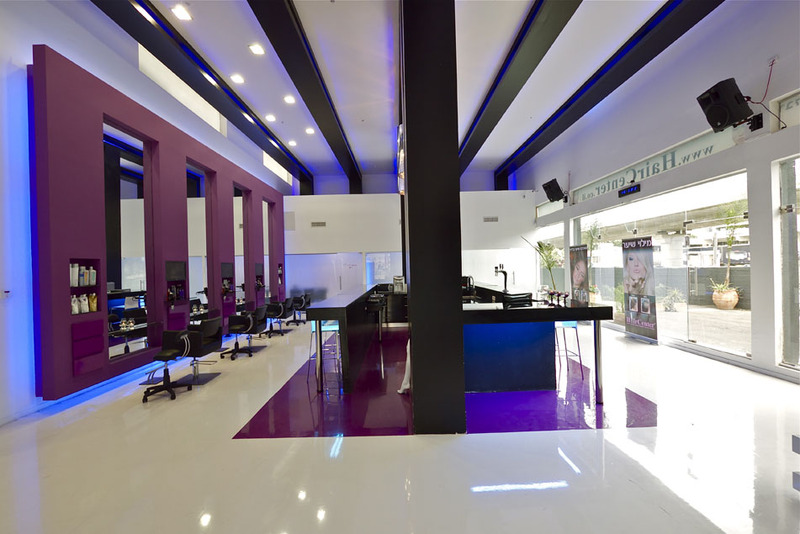 The hair salon shown here has 5 meter high ceilings and was designed in a unique style reminiscent of the local bars and night clubs. 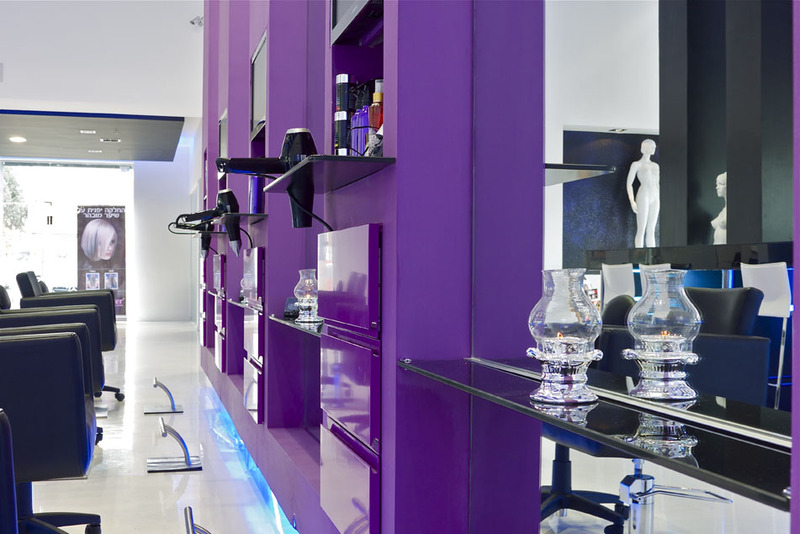 The interior of the salon is a refined design of the nightlife scene with its dramatic and dominant style. 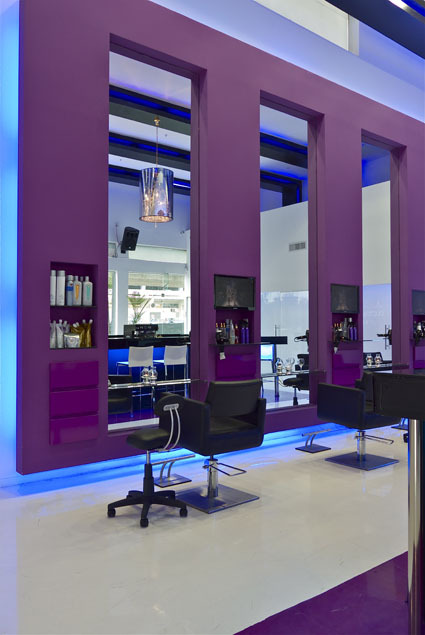 Upon entry to the salon there is the ‘wow effect’; colors and use of light combined with distinctive elements that are not usually used in this type of space immediately catch the eye. 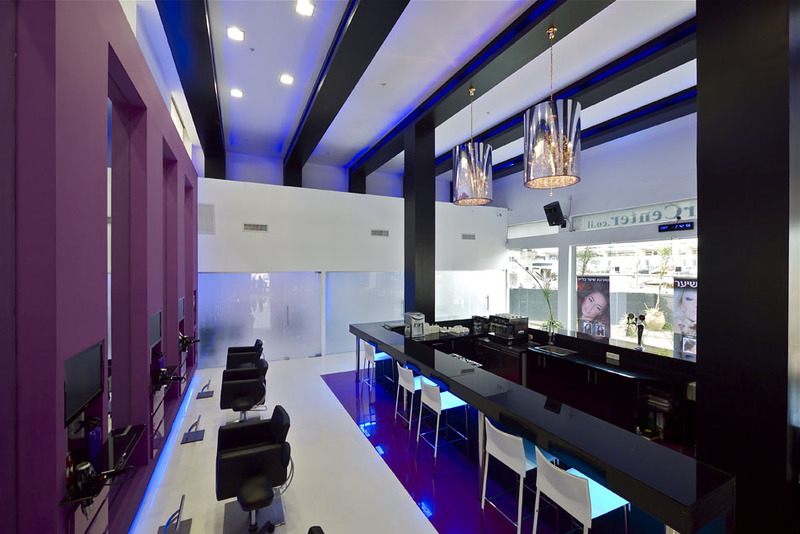 The salon has, in addition to the main area, three different VIP rooms, which were designed in a more minimalistic fashion, each one unique in its own way. 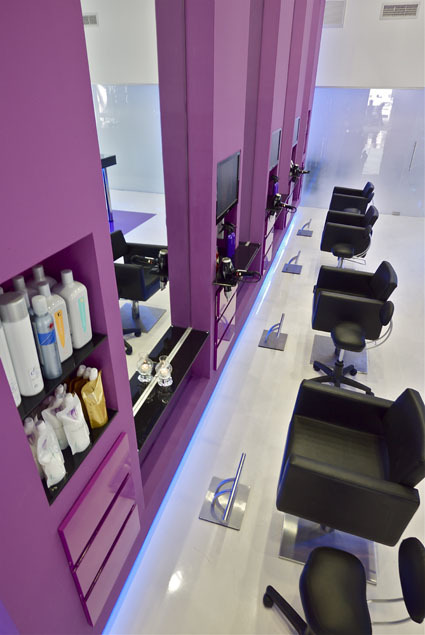 The decision to have the separate rooms came from the desire to give the salon a luxury and upscale feel, this also give a more intimate option for clients. 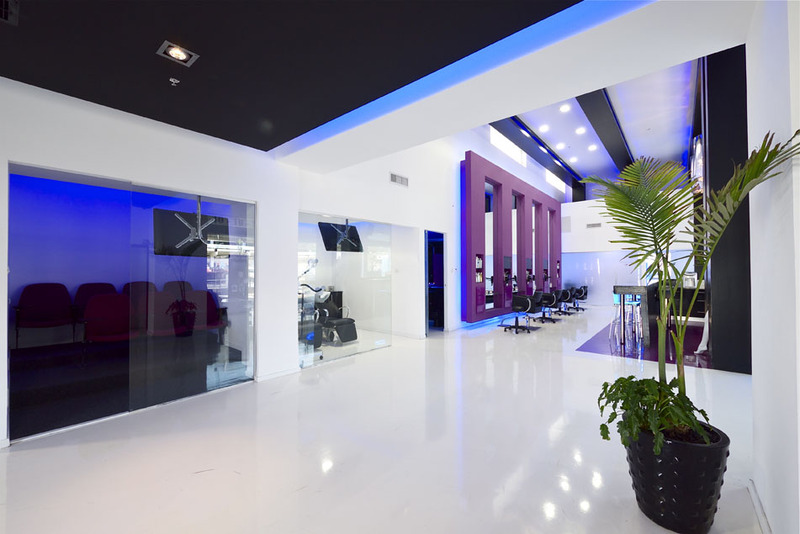 There is also a screening room, designed in a movie theater style, in which clients/staff have the choice to watch how hair extensions are made or the process of hair straightening. 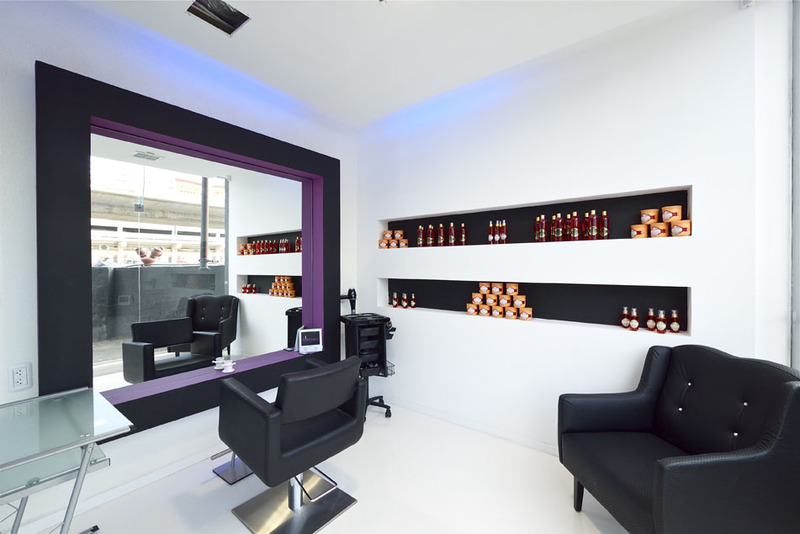 In the entrance hall of the salon a black, ‘hovering’ ceiling was built, in which there is hidden built in lighting with colored LED strips. 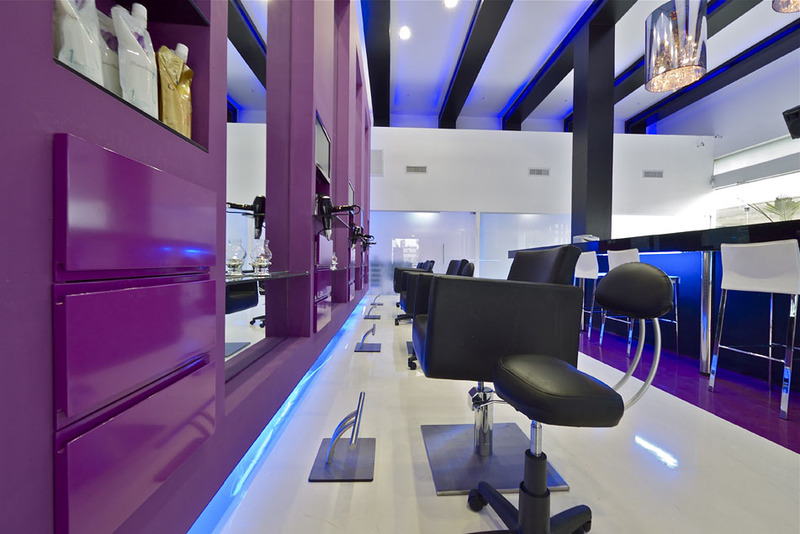 This dramatically designed ceiling gives customers the feeling that they are entering a nightclub rather than a hair salon. In the main are there are constructed columns that were left behind from the previous design that are also covered in black and textured with black vertical stripes. 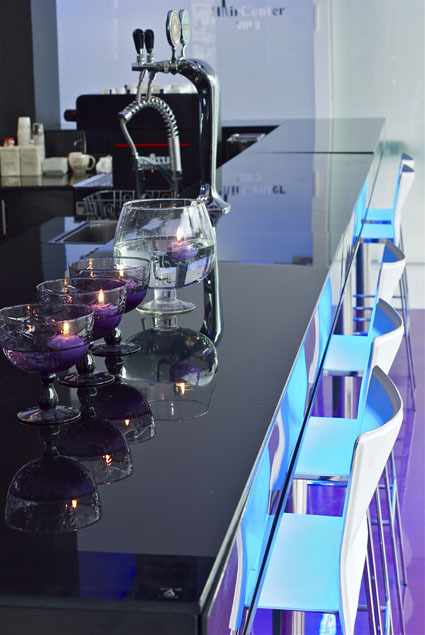 To complete the nightclub look there is, naturally, a striking, black bar that has working beer taps. A great deal of attention was paid to lighting detail in order for it to be decorative as well as functional. There is a mixture of different lighting in the space including: hidden lights, rapt lights, colored LED lights, and ‘green’ lighting along with two dominant chandeliers, which a constructed with aluminum parts and crystal. 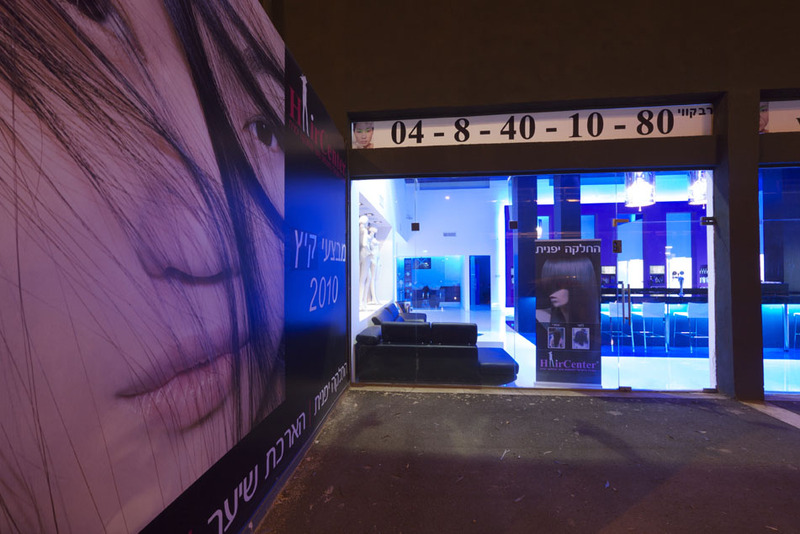 The integral lightings create enough strong light for this type of business while also giving a dramatic and unique nightclub vibe. 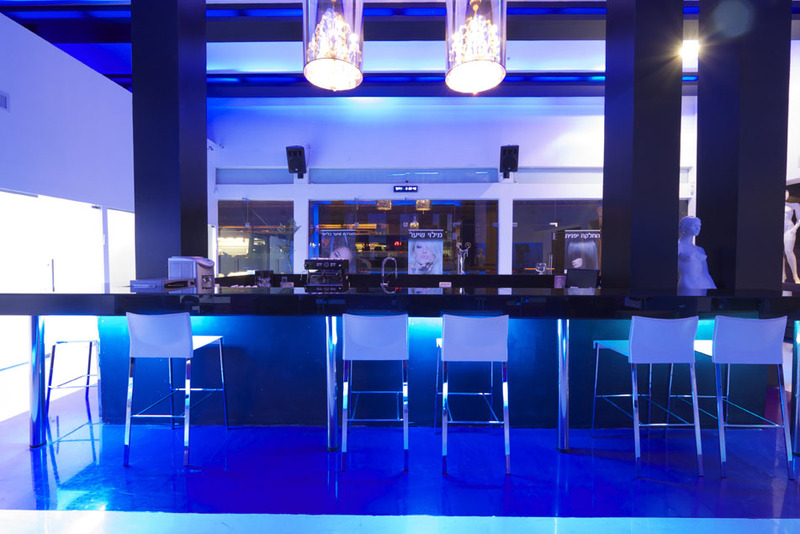 The surprising use of color also answers to the look of the nightlife scene. 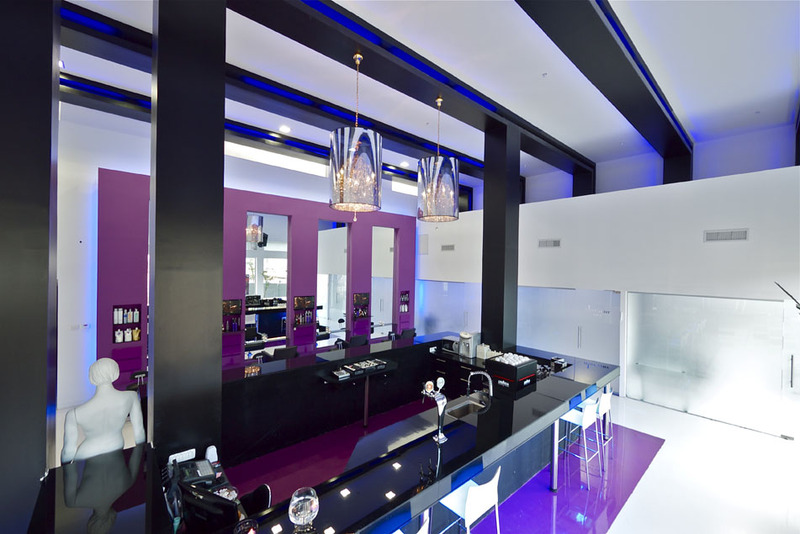 Combining black, white, purple, and blue creates a theatrical and unusual color palette. The floor which has an epoxy glossy white coating refines the overall look which gives the space a warm and inviting feel rather than just dusky. 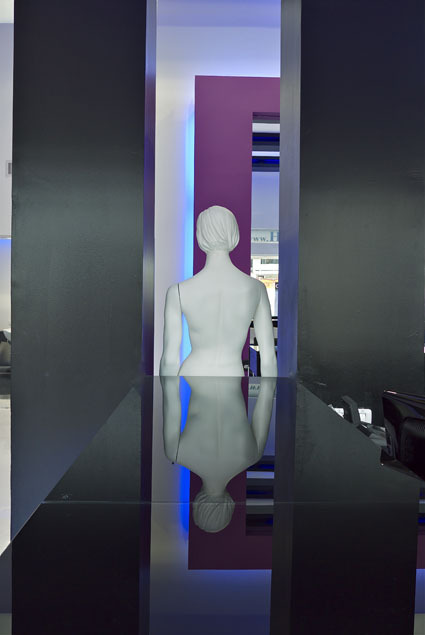 As part of the overall design there are elements that complete the look, like manikins, impeccably designed restrooms, a black leather reclining area etc. These elements tie together to make a perfectly balanced design.